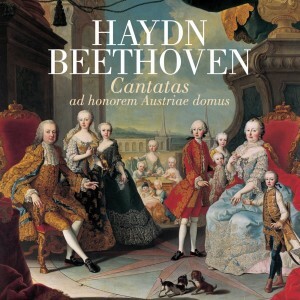 Cantatas - Ludwig van Beethoven - Mediální ohlasy - ArcoDiva management - Hudební agentura - Hudební agentura ARCO DIVA Management s.r.o. This release from Czech label Arco Diva is a live recording of two concerts held in June 2012.. The programme is of three rarely heard works separated by only ten years. Arco Diva has titled this releaseCantatas ad honorem Austriae domuswhich has been translated for me asCantatas in honour of the Austrian Court. The Haydn work is a traditional hymn of joy and thanksgiving and is thought to have been performed for the Empress Marie Therese during the visit of Lord Horatio Nelson with Lady Hamilton to the Esterházy palace at Eisenstadt in 1800. Richly scored and splendidly concise theTe deumis a product of the final decade of Haydn’s life demonstrating his firm command of contrapuntal forms. It seems that this cheerful work, overflowing with pious conviction, fell into neglect for many decades before undergoing a revival around the time of the 150th anniversary of Haydn’s death in 1959. Haydn did compose anotherTe deumHob.XXIIIc:1 which is also in the key of C major. It originated from the composer’s early years at the Esterházy court, first performed it seems in 1763 at Eisenstadt. In short this is a fascinating and well performed release that Beethoven and Haydn enthusiasts will want to consider owning.